The Triple Play Realtor Convention & Trade Expo is this week in Atlantic City. 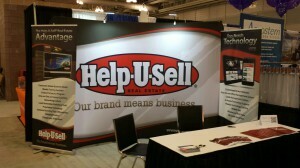 Help-U-Sell Real Estate is in Atlantic City this week for the annual Triple Play Realtor Convention & Trade Expo. The event welcomes REALTORS from New Jersey, New York, and Pennsylvania. Ron McCoy and several franchisees, including Dan Desmond of Help-U-Sell Bay Beach Realty, are on hand. Stop by booth #914 and see them today through Thursday, Dec. 12!